Birthday Quest 2018, Part 3 of 6: Three Cats, the Marion Kind « Midlife Crisis Crossover! My wife Anne and I have a tradition of spending our respective birthdays together on one-day outings to some new place or attraction — partly as an excuse to spend time together in honor of our special days, partly to explore areas of Indiana (or in neighboring states) that we’ve never experienced before. We’re the Goldens. It’s who we are and what we do. 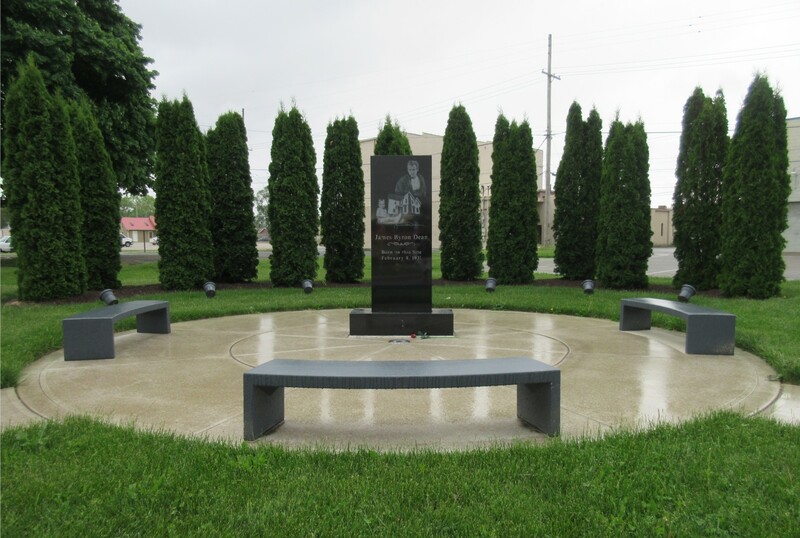 From the Pawnee-inspired digression we headed twenty miles west to the city of Marion, the only locale on our itinerary with a population over 6,000. If we’d had an appetite for lunch yet, it would’ve been the most likely place to find a bite, but artisan breakfast and ice cream kept us going well beyond that stop. 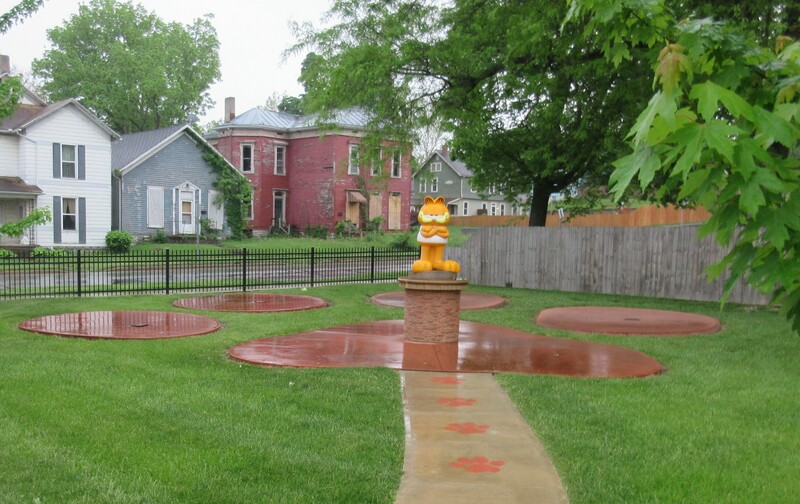 Apropos of our objective, Marion was the birthplace of Garfield creator Jim Davis as well as one legendary actor…whose history inspired yet another non-Garfield-related detour. 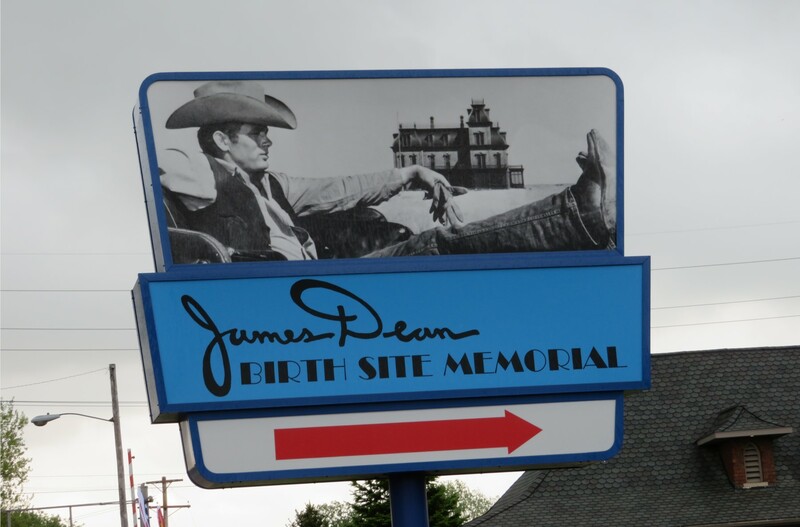 Hey, it’s the birthplace of James Dean. 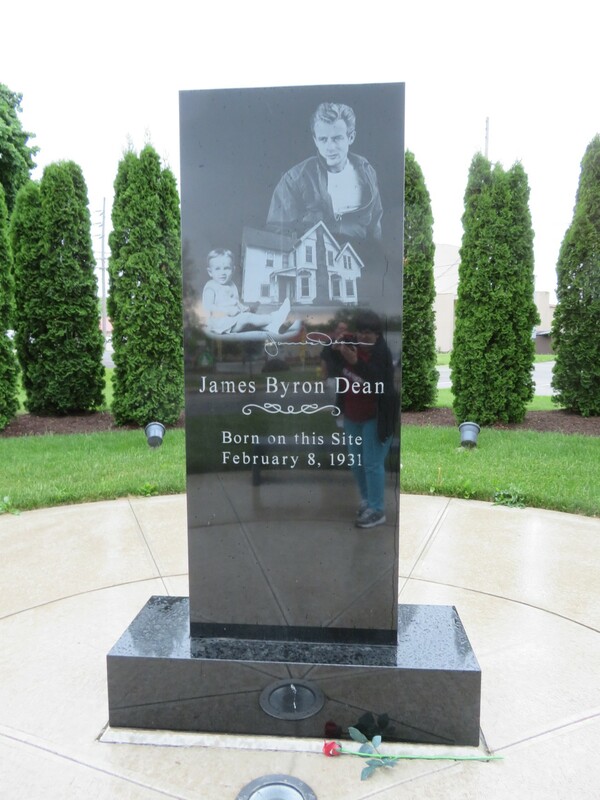 You might remember him from such films as East of Eden, Rebel Without a Cause, Giant…and that’s it. 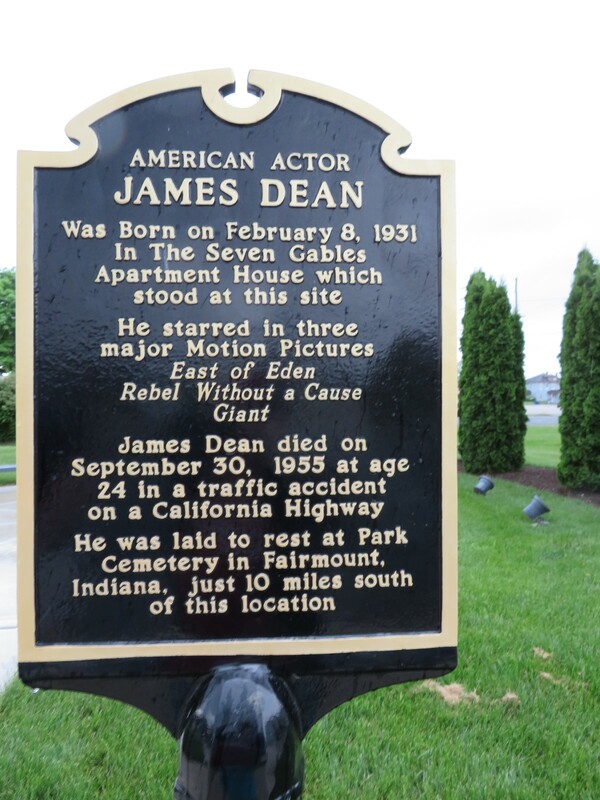 After three rounds of critical acclaim, Dean died in a car crash at age 24, but northern Indiana won’t soon forget. The small memorial park that might’ve been a nice place to rest if not for the rains that followed us here from Montpelier. The Wikipedia marker for the uninitiated. 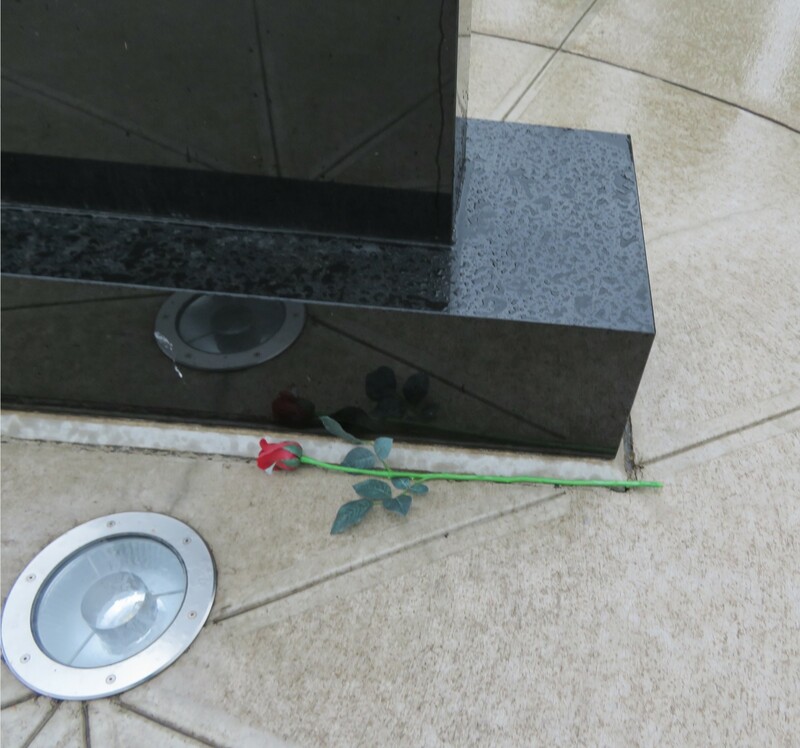 A fresh rose for a bygone idol. 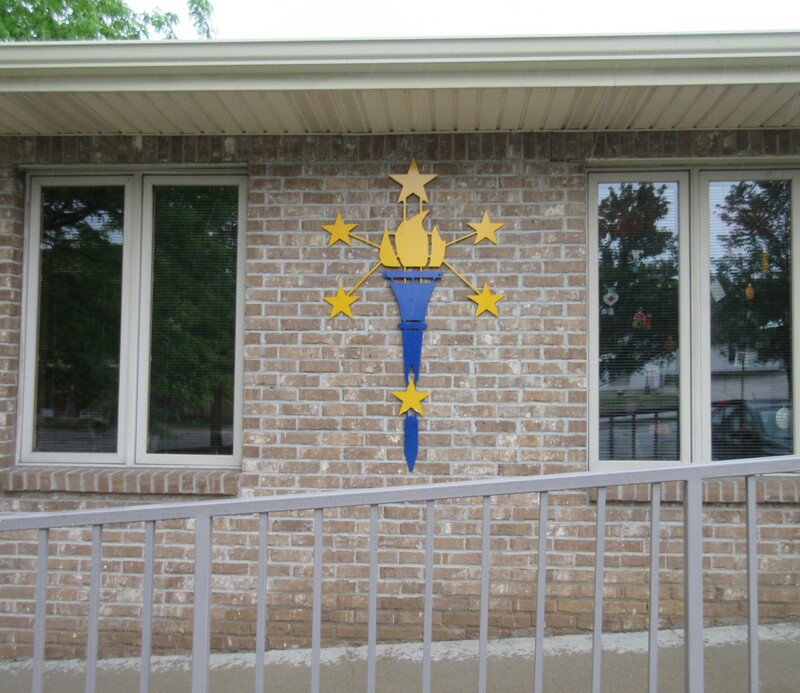 A few blocks west was the next red pin on our map, the Community Foundation of Grant County, the premier networking hub for a number of local charities…whose building blended in with the surroundings so well that we drove past and had to lap the block to return to their lot. The torch from the Indiana state flag is a nice touch, but didn’t scream “Community Foundation of Grant County” loudly enough to catch our eyes. 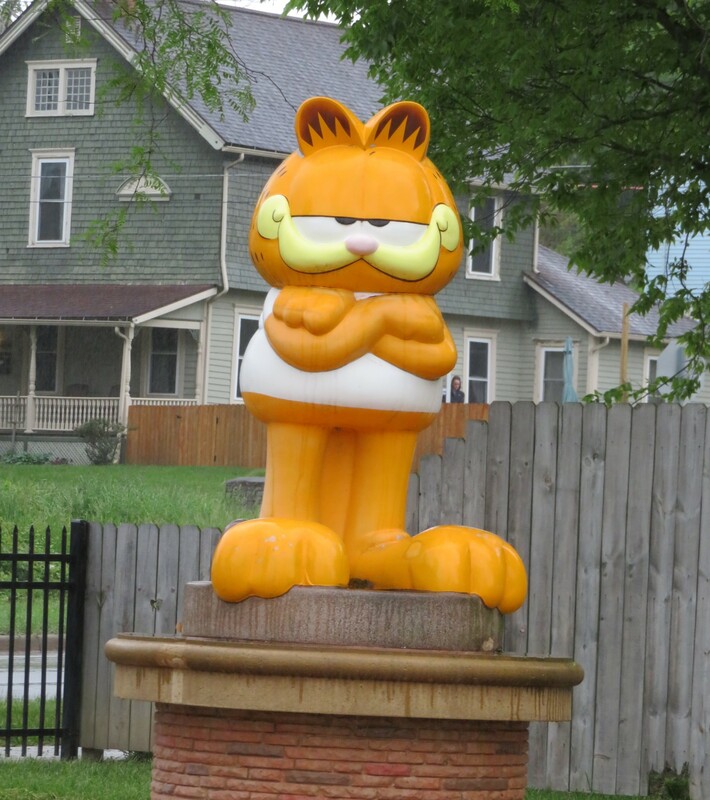 Theirs was the most recently dedicated statue of the entire Garfield Trail, so new that it wasn’t listed in some online resources and the details on the statue’s spot weren’t 100% clear. At first I feared it was in the building and unattainable since they’re closed Saturdays. 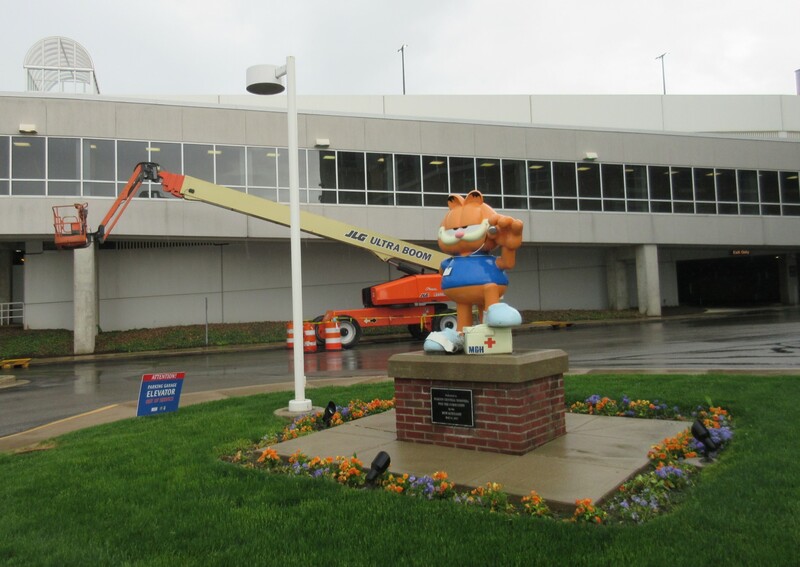 We’d already run into that obstacle too many times with the Muncie Garfields. We tried peering through the blinds like unseemly criminals. Would this be the closest we got to their Garfield? Then we walked around the building and noticed they had a backyard. 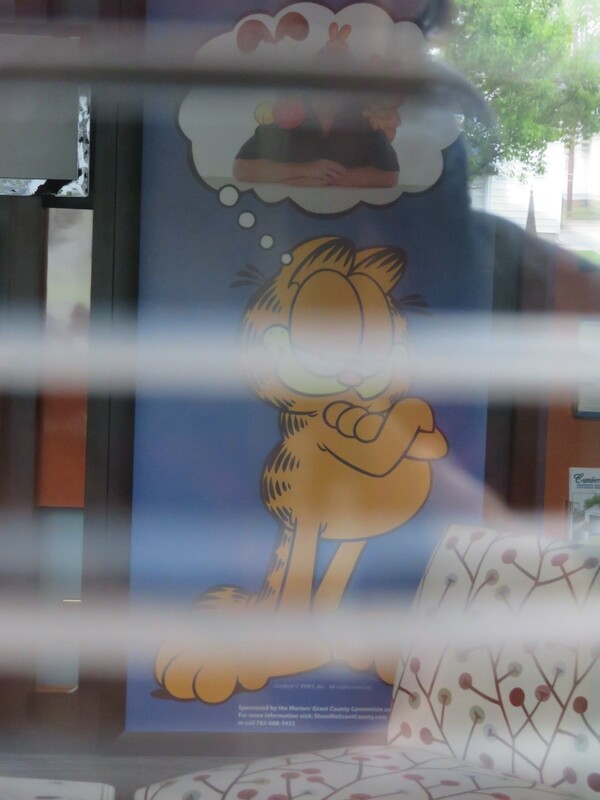 Garfield stared back at us. This Garfield appears to stand upon the paw of a much larger Garfield whose body is too gargantuan to exist in our dimension all at one time. #3, “Paws for Thought Garfield”. 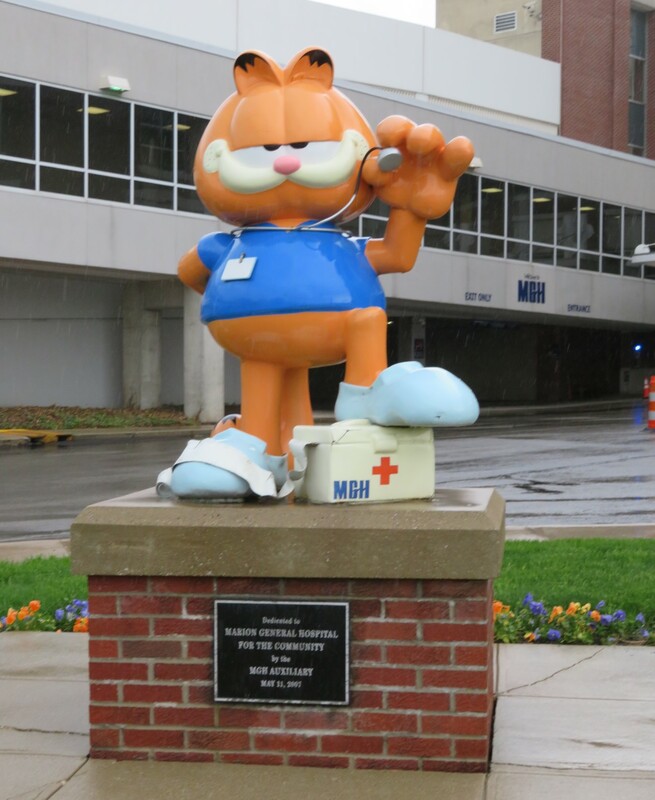 The Garfield after that one stood a few more miles north in front of Marion Community Hospital, a full-sized health care facility whose visitor parking lot was thankfully free and unmonitored by pesky guards who might shoo us away for not being ill or injured. #4, “Medical Professional Garfield”. He’s not there to represent for just the doctors. The northernmost Garfield of the day required us to do something we’d never done before, to venture into a frontier previously foreign to us. Its denizens were united for a single purpose, one we’ve never been able to wrap our heads around, one that you might understand more than we do, no matter how hard we try. This trip, for a few minutes, also became the story of our first time on a golf course. I’m a 46-year-old white guy who sometimes wears a tie to work, but I’ve never golfed, unless the miniature variety counts. No one’s ever invited me to try the real thing. I’ve never had a reason to look into it on my own. My dad was into golfing. We weren’t close, but I have a vivid memory of one of our few face-to-face conversations in which he excitedly told me all about the new divot-fixing tool he’d recently acquired, which naturally required him to explain what a “divot” is, and where they come from, and probably several other golf-based tangents. I kept my blank stare firmly fixed while he nattered on. I did not walk away with a newfound love of the game. As a kid who grew up in a section 8 apartment complex, I always assumed golf courses were strictly an extravagance for the rich, probably squared away behind a snooty security checkpoint that wouldn’t let in anyone who made under $200,000 a year. Once again I worried that a Garfield might be beyond our grasp. We drove onto the grounds of the Arbor Trace Golf Course and found no armed personnel threatening to gun us down for being the wrong class. We took one of the last open parking spaces without being questioned or carded. As we walked toward the main building, an ordinary male of the golfing persuasion walked toward us. I tensed up, waiting for the invasive questioning that would surely lead to us being escorted off the premises by a firm chap with a monocle and a London bobby’s baton crafted by the finest woodworkers. He walked past us without stopping, hailed a gentleman standing near another car that we hadn’t noticed, and conversed with him instead. The subject, of course, was auto repair, befitting normal males of their caliber. Inside the club, a teenage girl working the snack bar directed us to the next Garfield. One short hallway and two right turns led us to an alcove where their Monday-hating guest hid from the prying eyes of the outside world. 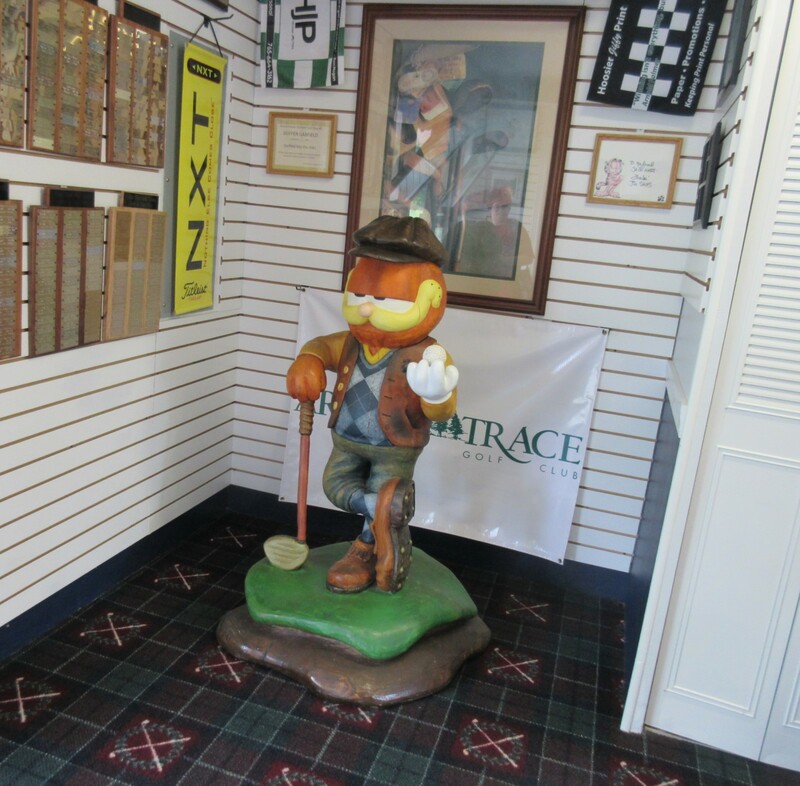 On the walls around him hung golf-accomplishment plaques, certificates, and a framed Jim Davis autograph. 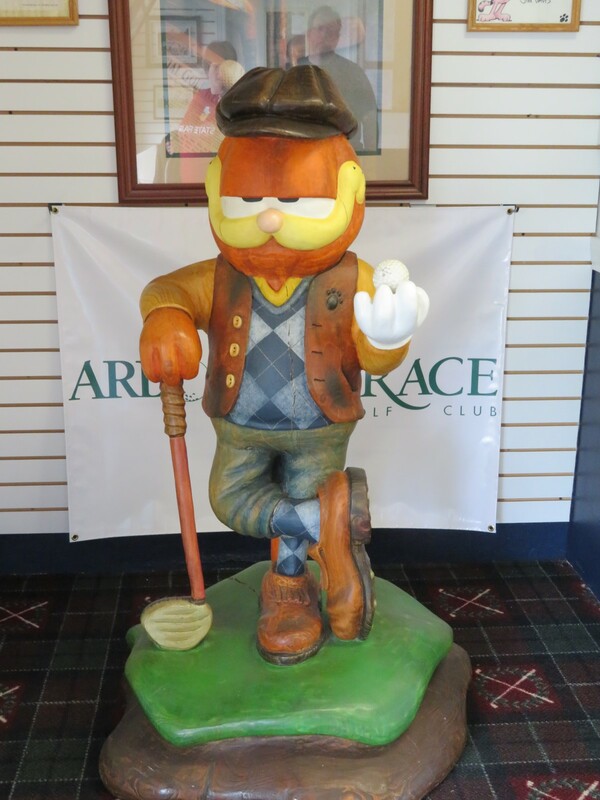 This statue also proved to us that the Garfield statues weren’t all molded by the hands of the same sculptor. We didn’t stick around to shoot 18 holes or even learn how a single hole works, but we did buy drinks from the snack bar on our way out — partly out of gratitude for the hospitality, partly because we would’ve felt weird coming in and out of a business just to gawk at a statue (though we’ve done that before), and partly because refreshments make long roads feel shorter. We left the golf course without incident, without a single man asking us for our tax forms or our household’s staff roster. The count stands: five Garfields down, six to go. To be continued!